Here is a recent game in the 8.Rb1 Exchange variation(D85) played in Basel this month. The counterattack is well underway. How should black continue? Schandorff proposes the following line in Playing 1.d4 The Indian Defences(Quality Chess 2012). 1.d4 Nf6 2.c4 g6 3.Nc3 d5 4.Nf3 Bg7 5.Qb3 dxc4 6.Qxc4 0–0 7.e4 a6 8.e5 b5 9.Qb3 Nfd7 10.Ng5!? Here is a recent(TWIC 946) game played in this line. Scandorff bases his idea on a 2010 Carlsen game where black played 12…Bf5 but now the trend is to 12…Na5 and other moves. I found improvements for both sides in this game with black’s coming before white’s. My overall conclusion is that 10.Ng5 leads to equal but complex play. In the early middlegame white seems to have nothing special going on. What do you suggest? 24…Rfc8(as played in the game) activating the rook at the cost of a pawn. After …Rc2, the active rook fully compensates for the pawn. Here is a game from TWIC 946(this Xmas morning!) from a topical Grunfeld line. The game was played in the World Cities TCh. White is building up for an attack. The bishops are ready and the central pawn chain blunts Bg7. What is next for white? TWIC 945 was a quiet issue for Grunfelds. 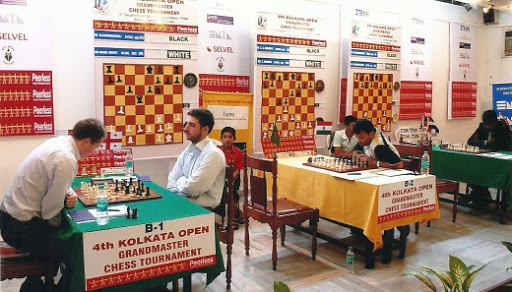 I picked one interesting game from the 5th Kolkata Open(IND) The game was won by GM Abhijit Kunte. Amongst Kunte’s numerous accomplishments is winning the 2006 Canadian Open Championship. Dzhumaev,M and Sethuraman,S shared first with 8/11. ‘He Started playing Chess at the age of 8. 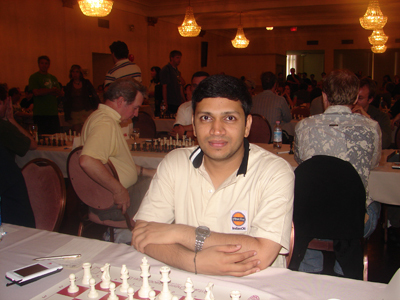 • Became India’s 4th Grandmaster in the year 2000 and second from Maharashtra. • Four Asian (Three Team and one Individual) medals (1 Gold ,2 silver, 1 bronze). • Two Commonwealth (individual) medals. (1 silver, 1 Bronze). • Member of Indian Team for past 10 years. • Represented India in last consecutive four Chess Olympiads. 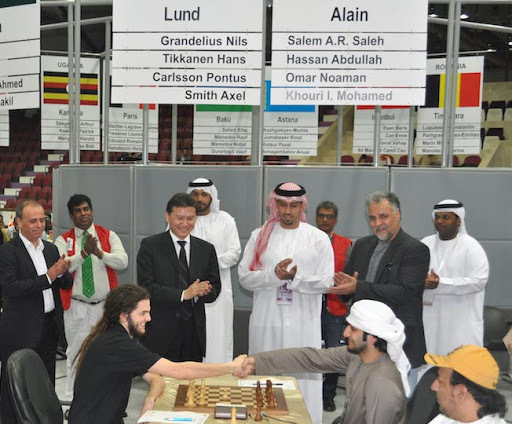 • Member of Indian Team which one Gold Medal at Asian Team Chess Championship at Iran. This is India’s 1st Gold Medal. • Winner of Canadian Open at Kitchner 2006. The knight attacks Re7 and b7. How should black defend? Black has just played 20…Re7 to secure b7 and the rook. Now white has to make some big decisions for example what is the future for Nd6? What do you suggest for white? The following position is now very popular in the g3 Grunfeld. Here is an important recent game showing the latest developments. What should black do now?